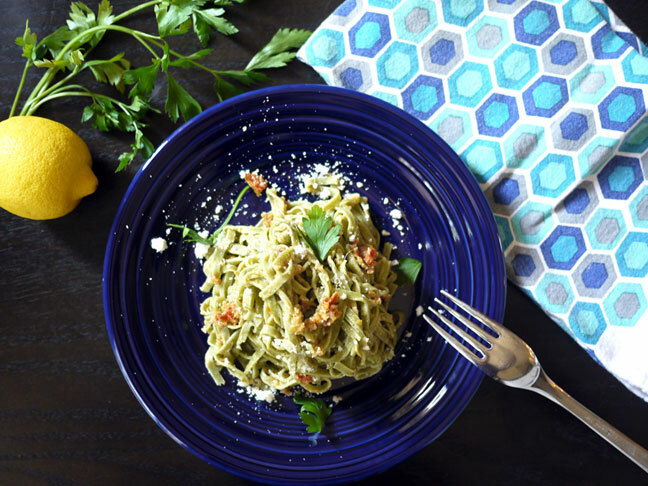 Food doesn’t get any more family-friendly than pesto. Add ingredients to a food processor, whizz and presto! Pesto is endlessly versatile, healthy, delicious and comes together in seconds. What more is there to say? Not much… but there are two more things that I want to mention. One is that pesto is way more than a pasta sauce. No matter what kind of pesto, think about using it in salad dressing, as a meat marinade, to dress veggies and whatever else you can think of. I got this pesto from Giada. No, she didn’t give it to me personally, but it’s something she shared with a bunch of folks at an event this summer. It’s a brilliant recipe, totally delicious with an unexpectedly fresh flavor. Not bad for something made nearly entirely with ingredients that are either shelf-stable or can be stored in the fridge for a long time. Keep your pantry stocked for this one—it’s a keeper! 1. Combine sun-dried tomatoes, olives, basil, garlic, oil, lemon juice and lemon zest in a food processor. Pulse until blended but still chunky. If serving with pasta, toss the tomato mixture, Parmesan cheese and salt and pepper with 1 lb of pasta; serve. Otherwise, transfer tomato mixture from the food processor to a bowl and fold in Parmesan cheese, salt and pepper; use however you like or store in an airtight container in the fridge for up to 3 days.